Ciechanow Castle is an impressive medieval fortress, bequeathed by history in the territories of Poland. Ciechanow Castle is located next to the eponymous small Polish town that enters into the composition of the north-central Masovian Voivodeship of the Republic. The Ciechanow Castle can be reached fairly easily by both cars and train. The most convenient starting points to get to Ciechanow Castle are from the cities of Gdansk and Olsztyn. Ciechanow Castle is considered one of the most beautiful, impressive and authentically preserved fortresses throughout the country. Built in the 13th century Ciechanow Castle is now covered by ruins, but this is a very attractive place to visit. Within Ciechanow Castle you can see the Augustinian monastery and church which were built in the 16th century and impress with its beautiful late gothic architecture. The construction of the Ciechanow Castle took three generations of princes and the basic architecture remains pointed at the Gothic style, although at a later stage the castle complex had added the Renaissance wing. The construction of the palace began in 1344 under the orders of Siemowit II. After his death the construction of Ciechanow Castle was extended by his son - Siemowit III and finally completed by Janusz I. Medieval Ciechanow was designed to withstand the prolonged and heavy siege. The fortress has a rectangular shape with dimensions of 48 x 57 meters and at each corner rises a massive defensive tower, which were once located shooters during combat. Another advantage of the castle is its strategic position. It rises to the natural elevation of a greater altitude than the surrounding areas. 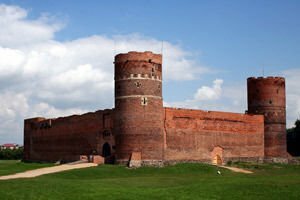 The defensive tactics of the fortress offered the archers an excellent view of the high towers of Ciechanow to the lower areas. The original height of the firewalls of Ciechanow Castle was about 5 meters. Over the centuries, the Ciechanow Castle became a source of inspiration for many Polish artists.